Annual 9 hole Christmas event with a Scratch and Handicap prize available,all donations received go to the Earl Mountbatten Hospice. 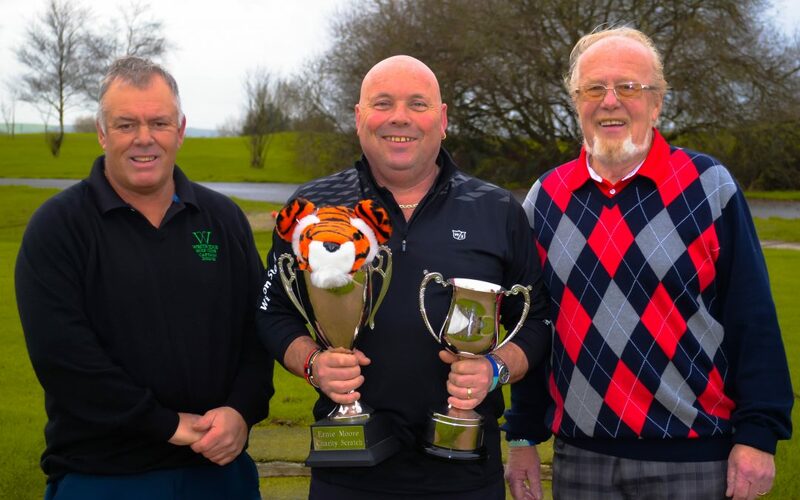 Congratulations to Dave TC May for winning both prizes and £357 raised on the day. Here at Westridge Golf Centre you will be sure to find everything you need this Christmas and with that special day less than two weeks away, now is the time to be getting those last minute stocking fillers or that perfect gift to put a smile on their face. We have fantastic stocking fillers starting at £5 ranging up to getting someone into golf with their very own package set starting from £169. We have your back this year with various different options and sales to make sure you find the right present for that certain person. There are many different golfing stocking filler ideas out there however, we have nailed it down to 3 key necessities that every golfer needs. They are a scorecard holder, so you can keep your scorecard safe and dry during a round of golf. Every golfer needs to practice their putting, so our next idea is a practice putting cup. This can be used on any surface and if you get it right at home with this practice cup then they will see their scores tumble! Our last stocking filler idea is something that a golfer cannot simply live without and they are golf tee’s. We have a large bag of wooden tee’s which you have the choice of three different sizes so you can be sure to get the right size for the job. To cover this range we have a plethora of ideas however, to name a few would be one dozen of Wilson Staff DX2 Soft golf balls which are available in either white or yellow. This is a great ball for this time of year as it’s a distance ball, however, still remains a nice soft golf ball to hit. The second idea is one dozen Nike PD Long golf balls. These balls are a nice firm golf ball perfect for that golfer looking for an extra bit of distance, plus they have an offer on at the moment where when you purchase a dozen Nike PD Long balls you get 2 FREE marker pens! You also have the option of purchasing a superior leather Footjoy sciflex glove. They are fantastic for that player who likes to have a bit more grip on the club and still likes to feel like they aren’t wearing a glove. Under this section we also have a large variety of options to choose from including golf balls, clothing and clubs! The first idea is one dozen of Titleist NXT Tour golf balls, these are a great ball for that person for a little bit more short game control and a bit more distance off the tee. However for the same price you could go with Callaway’s Supersoft golf ball which we have an offer on at the moment with where you can buy two dozen balls for £30, saving £10! These really are one of the best balls to come out this year, they have a soft outer layer which means you get a great response from the ball as well as having that bit of short game control. Any juniors that are playing golf or would like to get into golf then this could be the one for them. We have a junior clubs starting from £19.99, however, you can purchase a junior driver for £29.99! We have stock both US Kids and Golphin for kids, which are the two leading junior golf brands. To make sure we get the correct length of club for the junior try and get his/her height that way we can determine which colour code club to go for. We also have a range of Callaway, PING & Oscar Jacobsen clothing half price! Sizes range from medium to extra large. Once again this section there is a wide variety of choice depending on the recipient. We have Footjoy Greenjoy golf shoes in various colours and sizes, which come with a 1 year waterproof warranty. We also have Nike and Callaway shoes that are now half price! This brings the price of them down to between £35 - £50! If you have that junior that is in need of some new clubs then we have a Golphin for Kids driver and iron for £50, as previously mentioned if you are wanting to purchase any junior clubs try and make sure that you get the juniors height so we can guide you towards the best suited colour code for them. If it is clothing that you are looking for then we have the latest range of Under Armour and Nike pullovers and polo shirts. It is at this time of year that i look at next year’s feed program. Looking at where i need to make slight changes or different products. I am a firm believer in seaweed and will using more, in the coming years. With the attack of disease that occurred last month and the subsequent fungicide treatments, have left the greens lacking the correct balance of good bacteria. Therefore, any application of natural products, will help address this deficit. Keeping the cutting units sharp, also help combat further attacks of disease. If the cutting unit is blunt, it will tear not cut the grass leaf, leaving a wound that is vulnerable to attack. To that end, all of our greens/tee’s/surrounds units are currently being sharpened monthly. As mentioned last week, it is at this time of year i review the products used on the course. I look at the results achieved, cost against quality and versatility of use. All of these factors are considered when planning the following years program. I will be taking soil samples from the greens and sending them off for analysis. This will help fine tune my feed program for next year. As indicated last week, i am looking at changing to a more organic based feed program, which can only be a positive move. With the ever increasing ban on chemicals to combat disease, weeds, moss and pests, a move to a more natural approach is essential. A long way from when i started in the industry, when we used to apply Mercury based products and 2 4 5 T ! We can be very thankful that those horrific products are no longer used. Here on the course, although we have had a lot of rain, i aim to keep trolleys on where ever possible. 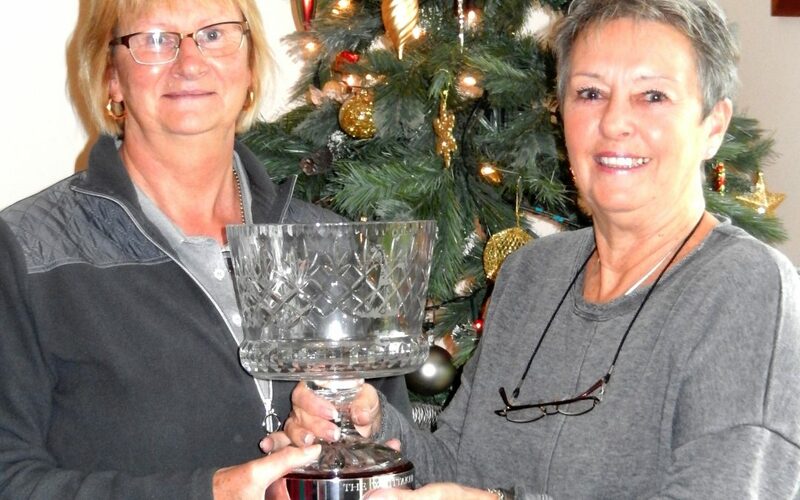 The Whittaker Bowl 2015 presented to Jasmine Royl, is an accumulation of points in ladies monthly qualifiers and Ladies Club Championship, points goes towards a league table. Congratulations to Jasmine Royl with 53points for winning the Whittaker Bowl, second Susan Macdonald 44 points and third Jill Prouten. Click this link to view Whittaker Bowl Table. Winter is well and truly under way and over the course of the next few months any golfers willing to brave the winter weather will experience weather such as wind, freezing temperatures and rain. So it is vital that you have the correct clothing, accessories and equipment to tackle these harsh conditions. A spare towel which is to be kept inside your bag or under your umbrella to stay dry . These 10 types of equipment are a winter must have to keep you warm and dry during a round of golf. Staying warm and dry during a round of golf is key to your rounds success, as if you get cold and wet your muscles will get cold and stiffen up which will consequently cause you to make unforced errors with your game. During a game of golf in the rain, it is vital that you keep you, your clubs and the rest of your equipment dry. This is important as if you get wet then you are likely to get cold and as previously mentioned getting cold is not ideal for your game. We don’t want our clubs to get wet, because when grips get wet then tend to become rather slippery which can cause the club to turn/move in your hands through a shot and cause another unforced error. Both of these can be achieved by having a double canopy “Gust Buster” umbrella to tackle the winds and keep you dry and also a waterproof bag cover to keep you bag and all that is inside dry. In our professional opinion for the majority of golfers it is better to use a lower spinning golf ball during the winter, because it makes the golf ball easier to control in windy conditions. You will still be able to get the ball to stop fairly quickly due to it being rather wet underfoot. Some golf balls that we would recommend would be either the Wilsonstaff DX2 Soft, Callaway Supersoft or the Titleist DT Solo. All of these balls have the characteristics suited for winter golf, as they all have a soft outer layer causing the ball to have a nice soft feel of all the clubs, however, they have a lower spinning core which is perfect for the winter. If you wish to get yourself kitted out for winter or need any advice on what equipment is best suited for your needs then please come and see us in store where we will give you advice and guide you into the right direction.